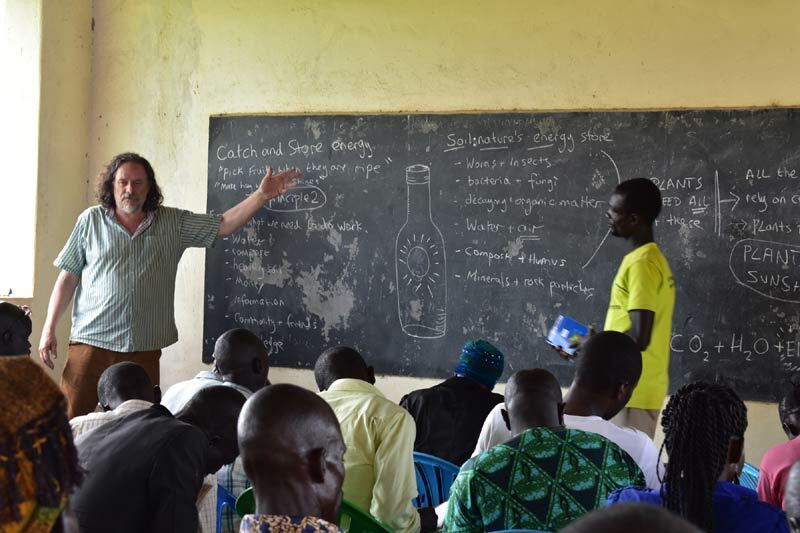 From PDCUG18, a full permaculture design course at Sabina School Kyotera, Uganda 2018. Video filmed and edited by Nina Moon. Practical sessions led by Ritchie Stephensona nd Grace Maycock for sector39 permaculture. Final preparations for the Permaculture Design Course! The Permaculture Design Course is starting this week, and it doesn’t feel real. Even though the work we have been doing has been in preparation for the course and convergence it still feels like we are just going to keep on doing what we are doing. This week has been about preparations out of the garden; sorting beds for 50 people, cleaning the school and the site, washing everything in the rooms, ensuring there is enough water, fruit and other foods for the UK teams arrival and then welcoming the UK team onto site. With Jagwe’s help we replaced the nursery bed shade, replacing the heavier more useful papyrus with reed matting which will provide a more even coverage over the nursery. We climbed up the rickety ladder that gets smaller and smaller as it goes up, and is balanced precariously against the nursery structure. Grace and I finished the job when Jagwe had left Sabina, fighting against ants that had moved into the reeds while they were being stored. With some help from the students Grace has been working on removing the lemon growth from the orange trees in the food forest. The roots of the lemon tree is stronger than the orange and so the two are grafted together but without proper management the stronger lemon growth fights through the oranges. 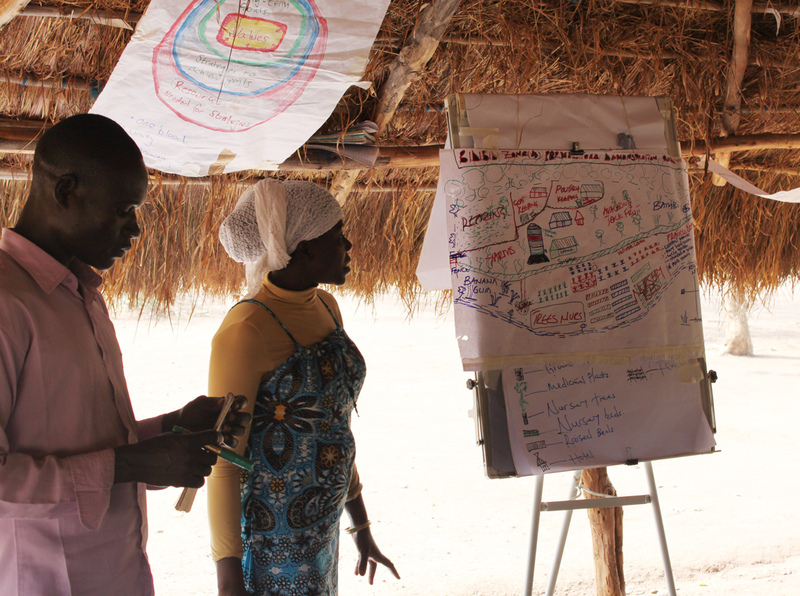 Jagwe observed that the trees were diseased which made us aware of how important it was for us to work on the trees. The UK team have arrived with energy, ideas and projects of their own which is making everything seem so much busier around the site. Richie is working on 407 projects all at once, building a beehive is his own personal project which he is doing around all the other woodwork that has been needed doing for weeks. The library has been painted, creating a brilliant white wall to be projected onto during the course for the big presentations . Han and I are working on making signs to put up around the site helping the participants navigate the grounds as well as making the site seem like an event space rather than just a school site. 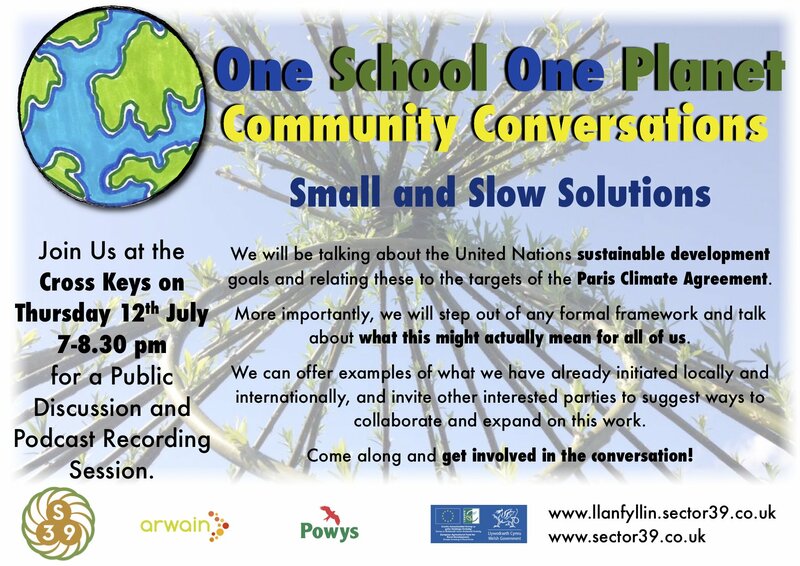 Helen and Charles have been able to work together to make plans for the Convergence, it has been great to get the team together so people are no longer just familiar names and email addresses. Dan has been working on making an estoufa finca (with Luigi’s help) which is a wood paralysis stove that burns from the top and cooks the wood below releasing the wood gasses and water vapour, little or no smoke is produced once it’s got going. When fully going it burns at 800 degrees c. Most people in Uganda live cooking on wood, the population is set to double in the next couple of decades and in the last couple of decades the forests have halves. Burning wood on the ground is at best 25% efficient and so there is a huge potential in exploring fuel efficient stoves. A few days after the first load of UK team members the rest of the team arrived. Now as a complete team we can focus on the course in more detail, everyone is helping each other prepare lesson plans and presentations. If there’s anything that someone on the teaching team is unsure about with everyone who’s here, there will be someone who they can ask. With more mouths to feed, we have had to change what we eat in order to be able to cater for so many people all at once. Aunty Agnes taught us how to make Chapattis which have been a staple ever since Richie perfected the art. Thankfully we collected enough avocados before the team arrived and so we aren’t missing our daily 3 avocado intake. It’s nice to share each meal with so many people, going from just the three of us who would eat together daily to more than five times that number now that the team has expanded. It’s a bigger affair with more people to get to know and more inspiring minds with a bigger range of conversations to be had. With participants arriving today and the course starting tomorrow everyone is working hard in the hot African sun trying to get themselves and the site ready. 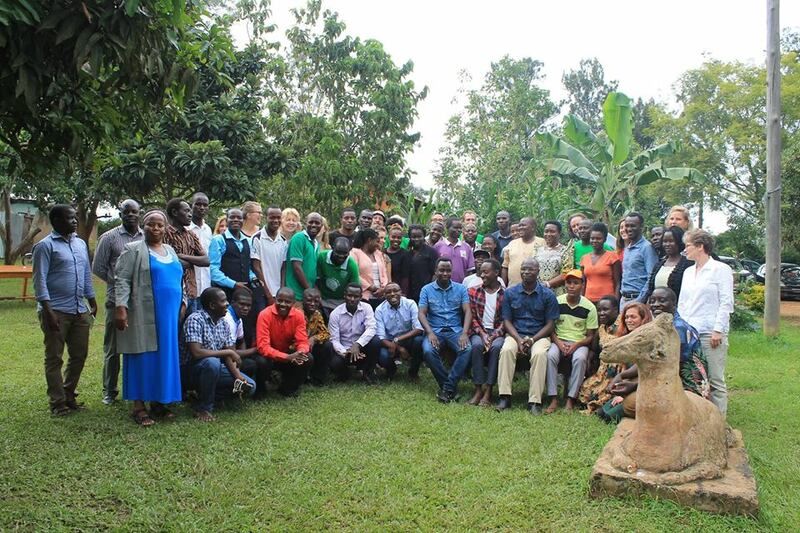 It’s very exciting how massive the course and convergence are to permaculture in East Africa. Hopefully this is just the beginning of something bigger than any of us can imagine. 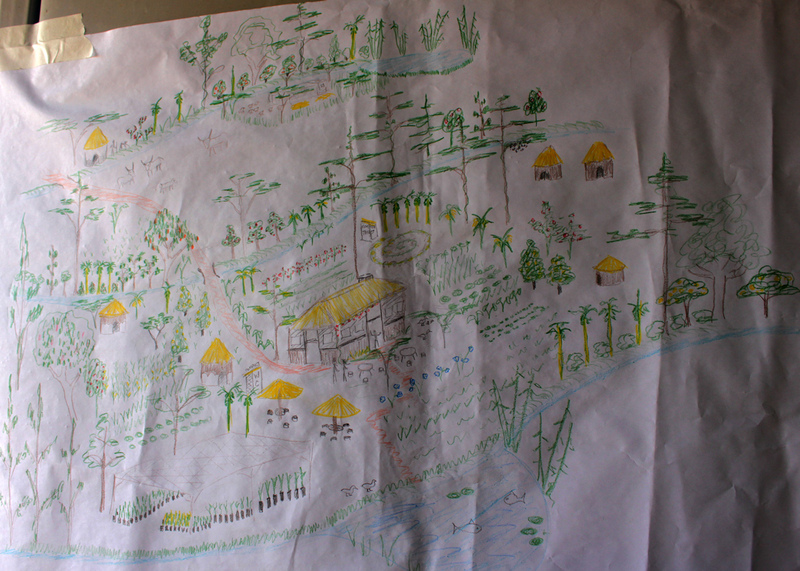 As we are getting closer and closer to the permaculture design course there seems to be more and more work to be done. 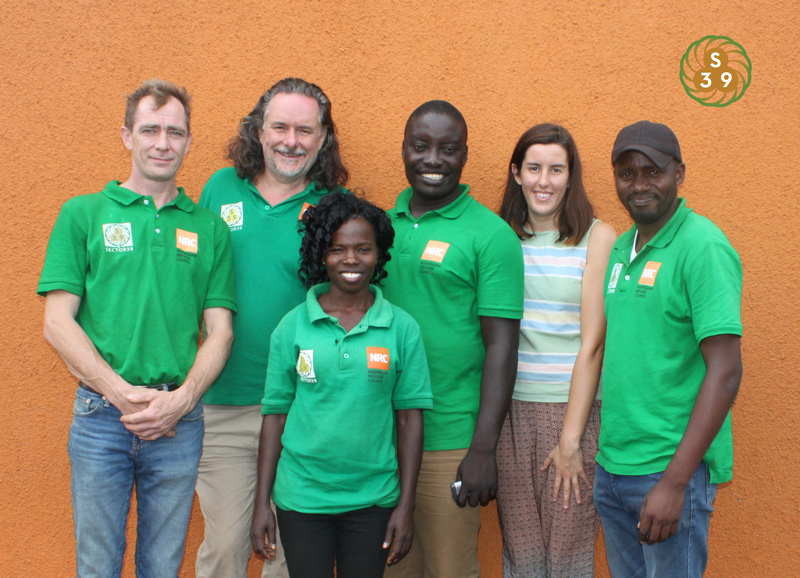 This week Charles has been in Kampala sourcing beds, bedding and basins for the course, Grace has been talking to him daily trying to sort out the logistics and prices for everything we need to make this course a success. Here at Sabina we have been transplanting everywhere, but there are still so many beds to fill! The rains have been forcing us to halt our work again, the rainy season is coming to an end and so we have to be thankful for the growth the rain has helped us to achieve in such a short space of time. We have been heavily mulching the beds before we transplant into them in order to keep the weeds under control. It has made the task longer as we plant but in the long term it has meant that we are not worried about weeding every other day. Yesterday, we bought 1kg it ginger from Sanje market which we will be planting today in the hopes of having an example that we can replicate during the course. 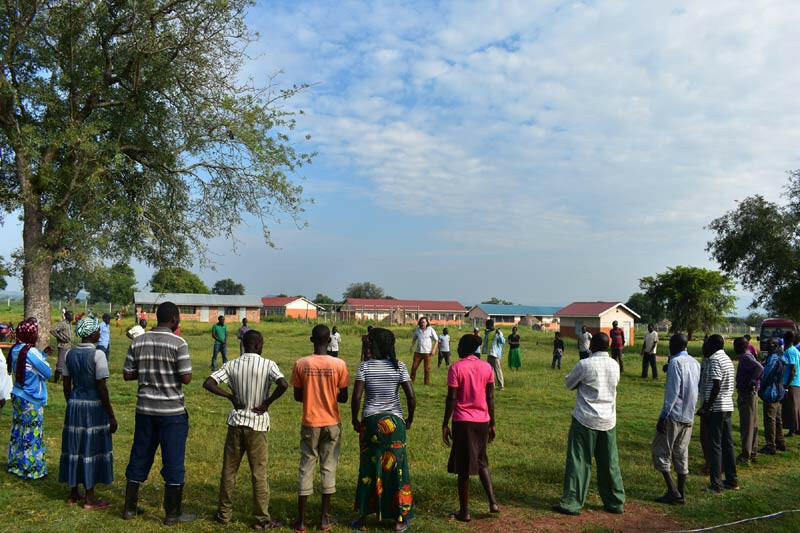 With the rest of the UK team joining us in the coming week we are super excited for everyone to see what an incredible place Uganda, and especially Sabina school, is. We are preparing the site for them and are looking forward to having those extra hands ready to help in the days leading up to the course in order to make the site extra ready. As the UK team arrive, the pupils of Sabina school are heading home for the holidays. Today the majority of the children we have gotten so used to seeing every where are heading home to their families. Some of the older students will be returning in a week or so to study over the holidays but I’m imagining the school site will be feeling very empty without them for a few days. Its been great having all the children around while we have been here, as it’s their school and I’m amazed by their willingness and want to work, getting involved in every project we are doing. 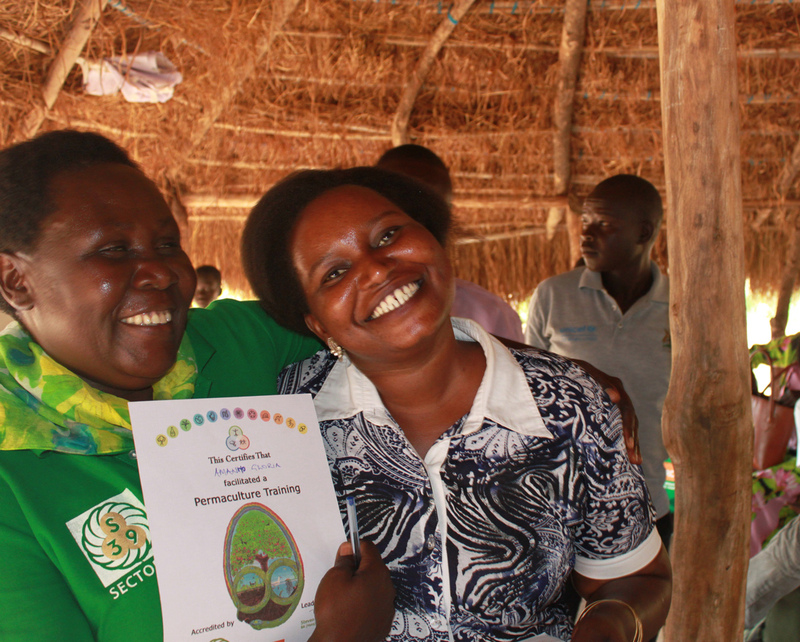 Not only in their permaculture lessons but in their free time too. Maria has been an especially consistent shadow to Grace, cheekily following her around as she works, chattering away in Lugandan patiently repeating herself until she is satisfied that Grace has understood what she is saying. Over the weekend Grace, Luigi and I left the site for two nights to celebrate Grace’s birthday on the Saturday. We were deciding between two lakes, Lake Mbara and Nabugabo sand beach and in the end we decided to visit the closer of the two as we didn’t like spending all day on a Matatu. We definitely made the right decision, we had the run of a campsite right on the lakes edge where monkeys were the only other guests. We woke up on the Saturday morning to the most incredible sunrise and the whole day we were blessed by glorious weather. We swam in the lake and when we got tired we could dry off reading in the sun. On the Sunday the weather was a contrast, it rained really heavily and we were forced to seek refuge in the restaurant playing cards and learning how to play pool. It was nice to be able to relax together, so we don’t just have a work relationship and we were able to chat about things other than weeding, plants and the permaculture design course. Jagwe has returned to Sabina for a few days and he is working on upright sack planting, a type of vertical planting used in urban permaculture to save on space. The idea is to keep the sacks strong and in place using a stone tower as a central pillar which also helps with water filtration throughout the sacks. He has been planting into the sides and top of the sack, in the sides he is planting light, leafy vegetables such as kale, pak choi, spinach and into the top the fruiting, heavier vegetables like broccoli, tomatoes or passions running from the sack to a post. He is using compost and we’ll balanced soil in order to secure adequate nutrients for the plants. Each week here at Sabina is very different, and it helps keep the monotonous tasks interesting. This week we have lots of people around the site helping us out. First Charles came back from Kampala, then (while he and I visited another primary school that he’s hoping to create links with) Gerald Jagwe joined us at Sabina. Later that night Luigi returned from Fort Portal. On the Saturday we had the help of 6 local workers who helped us to reshape the Mandela garden into beds ready for us to plant into. There have been more people around the site which has been a great energy lift and it has made everything move along so much quicker. Due to the fact that we have such a big team that stays here at Sabina, we have been able to also leave the school to make visits elsewhere. On Wednesday Charles and I went by Matatu and BodaBoda to Alpha and Omega school just outside Kalisizo where we were shown all around the school and we saw the crops they were attempting to grow in order to supplement the children’s diets. We were given a huge welcome by all of the children where they sang and danced for us before Charles spoke to them and invited the head teacher to the convergence. 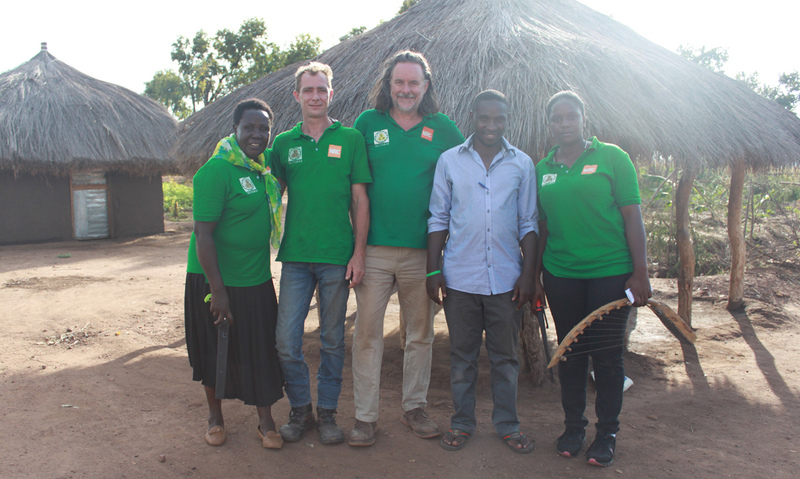 On Thursday Grace and Charles went to Masaka in order to cordially invite the local member of parliament, the regional education minister and the district chairman to open and close the Permaculture Design Course in May. They also were able to buy all of the things we have been unable to get in Sanje. In just one day Charles, KB and a group of children managed to build us a new shower that we really needed- it means we no longer have to bucket wash! The team worked really hard to finish the project in a matter of hours. It is a really a very peaceful feeling to use this shower at night as the moon has been getting bigger and so there has been enough light to shower without torches! Tom has been working further on a permanent toilet structure that will have removable buckets underneath. The idea is to dry the waste and use it as a fertiliser in the gardens in the future. Tom has been trying to make the structure with completely natural resources but has had to resort to using other materials in some places to better suit the structures function. We will have two latrines, one squat and one seated which will be accessed by steps enabling us to get to the buckets underneath the base easily. Fencing has been put up all around Sabina site, it encourages the children to avoid walking on the plants and instead to use the pathways. The school children have also found a use for them, so, not only have we created boarders for the gardens but also the school now has extra space to spread their clothes after washing them. One of the big changes we have made to the site this week has been re-landscaping the Mandela Garden which is just outside the kitchens. We had a group of workers come in to dig the beds and since then we have been sewing and planting into it with all sorts of vegetables that the kitchens will have easy access to once they have grown. Last week we mixed together some comfrey, chicken droppings and water to create a fertiliser tea, we stirred a few times over the week and it’s beginning to get nice and smelly! The kids can’t believe that something so foul smelling will be so helpful in the garden. After the rapid growth of the seeds we planted, we have begun transplanting them into the newly dug beds. The cabbages, chard, tomatoes, peppers, onions and kale have been especially successful in their growth and so we have been trying to dodge the intense heat to transplant them with the best chances of survival. The peas have been shooting up getting bigger and bigger everyday, we ventured into Sanje and purchased some local beans from a shop there which we have sewn this week and hopefully they will begin to show in the coming week. The weather here at Sabina is very changeable, if in the morning it is really hot then it’s almost guaranteed to rain in the afternoon and vice versa. We have had some ridiculously hot days where everyone has to stop working outside and also torrential rainstorms which again disrupt our work schedules. The pupils have been getting more and more brave spending more time with us than before, our hair is especially popular with the girls who are twisting it about and brushing through it at every opportunity we give them. We have also been able to introduce them to some card games like UNO and Go Fish which they have really enjoyed, they taught us a game called Mattatu which translates to just ‘cards’ and everyone knows how to play this one game. I have also tried to introduce games I know like African Bend-down and 21. The children have all loved getting to know us better and it’s been nice to share some games with one another. With the help of the permaculture class we have been able to create a large compost area which they will be able to add to now that they understand the components and processes. The primary 6 class had the opportunity to plant their own tree into our new food forest garden. They chose mangoes and orange trees and under Charles’ supervision they carefully planted their trees into the hole of their choosing, digging the earth so it wasn’t so hard for the young plants and working together to water and mulch after planting each new tree. All together we planted over 45 trees with the classes help which will be producing fruits in a few years that can help supplement the children’s diets. We have experienced the negative to everything growing so fast- weeds. The places that we spent hours weeding last week are beginning to turn green with weeds again and with so much land to upkeep it’s a huge job for everyone involved. We have had a big job weeding around the carrots and chard some of which we harvested for the kitchens so that the children can have a more varied meal for once! This week there has been a drumming soundtrack to our work, the children are rehearsing for a competition between local schools. They have been drumming, dancing and singing all week in preparation for their competition. On Saturday night we ventured into the rehearsal studio (the dining hall) and were enthralled by the energy that everyone had, with even the smallest children up until 11pm dancing and drumming! Dan taught Grace how to drum -Ugandan Style! The most exciting progress this week has been the compost toilet, it has taken us far longer than we anticipated but it is worth it! Grace and I have been quickly learning basic carpentry on the job! We decided to do this project at the wrong time in some ways due to the fact that both Charles and Luigi are away for the majority of the time we are building and our strength doesn’t match theirs! Thankfully we have had help from other people who are working around Sabina School. Initially we designed how we wanted the compost toilet to look and act from a book about composting in Africa (thanks to Dan Grove! ), but we came across some issues and had to improvise their solutions! To begin with we built the frame with poles that were too thin and as a consequence not strong enough. We decided instead of working with what we had to remake the structure and now it is really strong! The sides are made from papyrus and it has a tin roof, we have included a ventilation pipe in our design, this is to try to minimise the amount of flies and smells in the toilet when we have finished. We had help to build the pit for the toilet on Friday from some of the children around the School, in the heat of the day it was tough work for everyone involved and the children playing about us really made the time go quicker! We used one of the smallest children, Marion as a measure of how deep we were digging the hole. She took great pleasure with being lifted in and out of the hole. While we were digging some of the younger children were catching flying white ants and holding them in banana leaves, we were told that they taste really nice- we are yet to try any! It has been a week since we made the first compost heap and today we have turned it over, it’s super impressive how quickly it is decomposing down and how hot it is!! 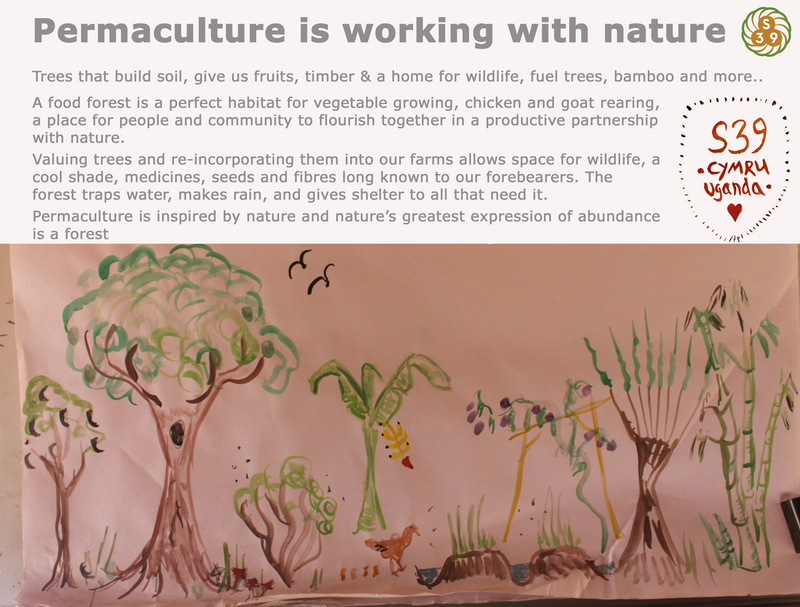 Unfortunately the permaculture class on Monday was cancelled due to exams and so the children didn’t get to help us and understand the next stage in the process, hopefully they will be around next week when we do it again.